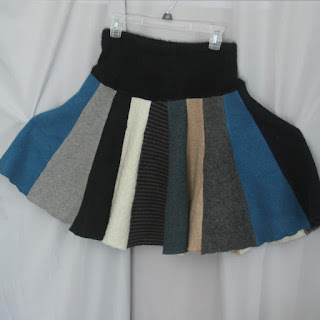 So here's a skirt made from yesterday's endeavors. It is a skirt all in and of itself, but it was also a dry run for a skirt that someone has ordered. I needed to know if I could make it the size my customer wants, and if not, what to change. I'm totally inept mathematically, so I can't design a formula that will tell me what size to make the panels. I have to do it by trial and error - which is not tragic, since the trials net me skirts that can go in my booth and my etsy shop. Sigh...certainty would be nice, though! 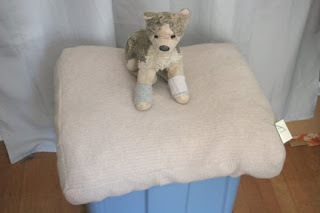 I filled up my scrap box again, so I will have to make another dog bed. (The scraps not big enough to make something of turn into stuffing.) I don't think I have a sweater big enough for one right now! The puppy belongs to the Boy, and is wearing wrist warmers that he requested I make when the puppy was more a part of the Boy's life. Used to be that puppy went everywhere the boy went. Not so anymore...more sighs.